Your spa treatment wouldn’t be a luxurious experience if you were fidgeting on an uncomfy chair now, would it? For thousands of years ‘The Chair’ has been an article of state and dignity. It is still regarded as an emblem of authority, in addition to its utilitarian nature. More recently, chairs have come to play a vital role as the central statement in any well designed interior. As you walk in to The Nail Spa (TNS), you can’t help but notice the sleek curves of the elegant spa chair. Smoothly draped in a voguish rich metallic purple, it sits with pride before it unveils its potential for the utmost pampering experience. This chair has been exclusively designed for TNS by Francesco Lucchese, of Lucchesedesign from Milan, Italy. He flew down to Dubai for an entire week solely to observe and work with therapists and clients. All angles meticulously monitored, every inch measured, each activity in the circumference of the spa chair such as ergonomics, health, comfort, functionality, height, distance, and above all aesthetics were kept in perspective. The prototype of this custom – made spa chair was crafted at the Molteni Factory in Milan bridging the gap between concept and reality, striking an absolute yet rare balance between functionality and style savvy – ness. Allow yourself an indulge nt treat as you hang your purse to the right so that it doesn’t touch the floor. Pull out a magazine from the left sleeve as your feet rest on the slide – out foot rest optimally placed in a position comfortable for client and therapist during a treatment. A minimalist wall houses an optional head rest, facilitating multiple treatments in the same spa chair without impeding the ongoing manicure and pedicure, saving clients their valuable time. 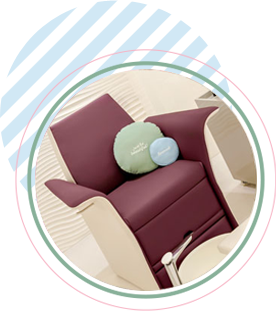 During the pampering treatment the therapist also looks exceptionally comfortable sitting on her seat as if she was being held in a perfect stress – free incline. Zero tolerance for mess, as disposable hankies are smartly placedunder the right side of the therapist’s seat and disposed of in a bin provision on the left. By now, completely impressed by the grandeur of the chair, you place the beverage you had ordered earlier from their tempting menu on the portable trolley conveniently located at the right height. You came for a treatment, were pampered by both ‘The Chair’ and the therapist, and left feeling refreshed and heavenly. 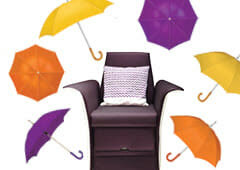 Who knew that exceptional service and a chair could leave you in a state of bliss?